Check out the latest resources in the Toolkit focusing on the theme of Collective Identity. We have some great new activities for you. They include activities using debate and discussion, reflection and some creative arts, as well as those based around stimulating texts and movies. 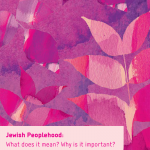 And for a great Passover-themed activity, check out “Collective Memory and the Haggadah“, a discussion activity focused on some of the core components of the Passover seder.